If you are a parent with a 4-6 months old kid, one of the best investments you can make for your kid is purchasing a quality high chair. These chairs allow parents to feed their kids on the dining table when the rest of the family is enjoying their meal. The best thing about modern high chairs is that they have different reclining positions which allows the kid to sit comfortably when you are doing other duties. You will also find that these chairs are affordable, easy to clean and very safe for the kid. Apart from that, they are made of quality materials and have a thick padding to make the kid comfortable. However, today these chairs are so many and choosing the best may be a bit confusing. To make your work easier, this article will reveal the top 5 high chairs you should consider and other important details. When Should You Use a High Chair? You should also ensure that the kid is sitting in an upright position when eating solids. Check the recommended age for a chair before buying. First, always ensure that the crotch strap is tightly secured to allow the kid to sit snugly on the chair. Do not forget to use the restraining system which comes with the chair. You should never use the lap table as a restraint system. Never leave the kid in the chair unattended. Also, You should never allow the kid to climb on the chair. To prevent hazards, ensure that the chair is far from the table or countertops. This prevents the kid from pushing the chair using his legs. You should also ensure that there are no items around the chair. Kids are very curious and will try to pick items around them. Check out for recalls. In the recent past, millions of high chairs have been recalled for being unsafe for kids. Make sure the high chair you are using is not among those that have been recalled. Why Should Parents Use a High Chair? They are designed for kids– These chairs are designed for kids and most of them are able to adapt according to the demands of your growing kid. They also come with adjustable height which enables you to adjust according to the size of your kid. This ensures that the kid is very comfortable. Easy to clean – You do not need to worry about how to clean a high chair. They have removable parts, which makes your work easier when cleaning. The parts are also resistant to stains. Some are dishwasher safe. Extra features – They come with advanced features to make your kid comfortable. Some come with reclining seats, 5-point harness system and others are very easy to fold. The best thing about these chairs is that they are very versatile and are able to adapt according to the demands of your growing kid. Encourages participation – They allow the kid to engage with other family members while sitting. They also promote healthy eating habits for the kid. Apart from that, kids can engage in other activities such as scribbling, which enables the kid to develop different skills. Size – If you have a limited space, you should look for a chair with a foldable design. A good high chair should be easy to carry when traveling and should fit perfectly in any room. Adjustability – Look for a chair with an adjustable height. Ensure that the chair can be adjusted as the kid grows. Ease of cleaning – A good chair should be easy to clean. Ensure that the high chair you have selected has removable parts which are easy to clean. The parts should be washer save and if you can get a seat cover would be better. Home décor – It would be better if you can find a high chair which matches with your dining or kitchen furniture. Sturdy – Ensure that the chair is made of quality materials to ensure that t is safe for the kid. Price – Do not just go for a high chair because it is affordable. 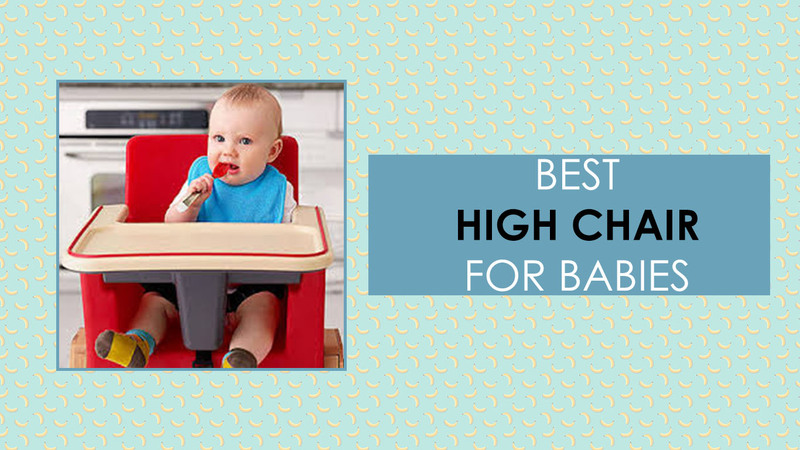 Most of the cheap high chairs are made of low-quality materials and do not last long. Comfort – The seat should be well padded to ensure that the kid is comfortable. Ensure that the seat cover is made of a soft material. Padded chairs with a pattern are the best since they hide the stains better as compared to those with solid colors. Toddler high chairs are a perfect choice for parents with small kids. The best thing is that they are affordable and very easy to use and lets you go about your business without having to monitor your little one. You will also find that they are easy to clean and comes with reclining systems to make your kid comfortable. Most of these chairs have an adjustable height which makes them ideal for kids with different heights. Some are large enough and can accommodate two kids. 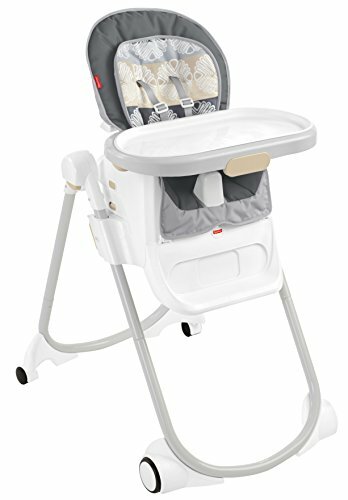 If you have a limited space, you should look for Fisher-Price 4-in-1 Total Clean High Chair or Cosco Simple Fold High Chair, Elephant Squares. These chairs are portable and have a foldable design. This makes them a perfect choice for parents who love traveling much like an infant car seat. 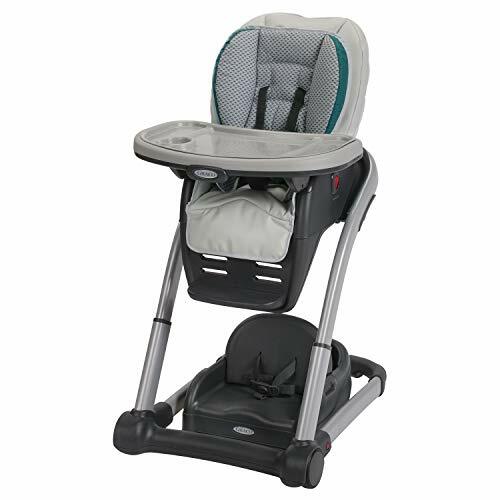 Graco Blossom 6-in-1 Convertible High Chair Seating System are great choices for those who are searching for a high chair with different recline positions. In addition, it features a 5-point restraint system. The chair is very safe for kids and the best thing about it is that it is very easy to use. You can easily convert it into a 3-point restraint system. Apart from that, it can accommodate a maximum weight of 60 pounds. This means two kids can use it comfortably. It does not have crevices below the cushion which means that it is not easy for foods to stick on it. 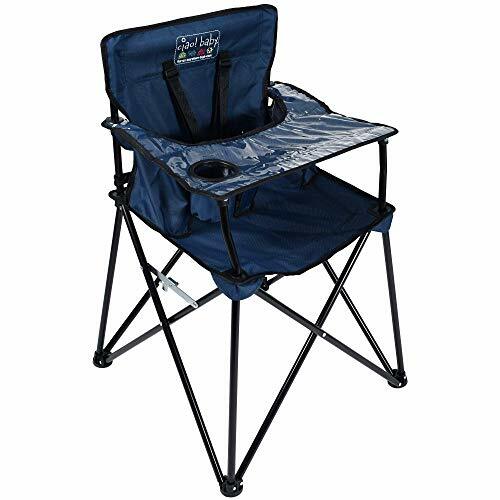 The chair is easy to clean and you can just lift it up and wipe the plastic base. The chair also features an extra insert which is placed in the infant’s seat. The insert is easy to remove and you can easily clean it in a machine. You can easily clean the main cushion using your hands. Additionally, it has three recline systems that enable you to adjust it easily when feeding the kid. The best thing is that it is able to accommodate the needs of your growing child. 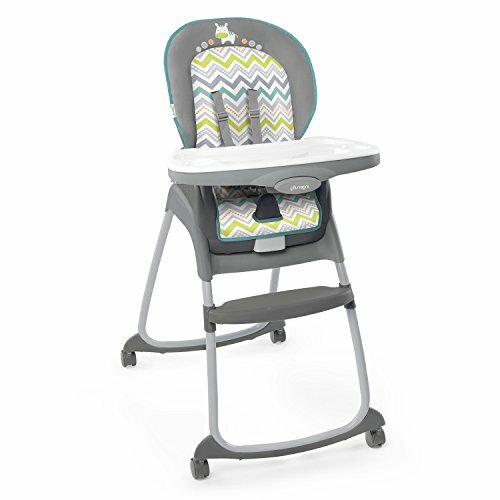 This one is one of the most affordable toddler high chairs you can find today. The best thing is that it can be used for three different functions. You can use it as a high chair, a toddler seat and as a booster seat. This makes it a perfect choice for a parent with more than one kid. The best thing is that it can accommodate two kids at once. It is firm enough to ensure that the kid is well protected. Apart from that, it features 5 points harness which ensures that the kid cannot wiggle out of the seat. It is a nice chair for a kid who is just learning how to sit. It allows the baby to sit upright and it can recline fully or slightly. It features 4 locking position which allows you to adjust according to the age of your kid. When the kid gets a little older and doesn’t require to recline anymore when easting, you can easily remove the seat from the stand and fix it to your dining room chairs. The best thing is that it can accommodate two kids at once. It also comes with wheels which allows you to move your kid around as they enjoy their snacks. It features two trays which can easily be removed when cleaning. The seat pad is also removable and you can easily clean it using a dishwasher machine. This means that it is very easy to clean. This one is a perfect choice for a parent who is searching for a compact toddler high chair. The chair is lightweight and does not require a lot of space. This makes it an excellent choice for parents who love traveling. It weighs 13.9 pounds and has measurements of 25.3 X 18.3 X 6.1 Inches. It is very easy to set up which makes the work of the parent easier especially when the parent is doing other house chores. Unlike others, this one is very easy to fold and you can easily place it in the living room when the kid is watching the TV. You can also place it in the dining room when you are feeding the kid. The chair is durable and comes with a 3-point harness to ensure that the kid is safe. You can also adjust it in three different positions and this enables it to adapt to the demands of our growing child. It is able to accommodate a weight of up to 50 lbs. Another thing is that it is very affordable. You should also note that it is very easy to clean. All you need to so s to wipe it using a wet cloth. This one is one of the best high chairs which has three sitting positions for your kid. It can be used as a high chair, table chair and also as a right size chair. It has a nice design and it is well built to ensure that the kid is very safe. You can also adjust it according to your preferred height. Apart from that, you can easily detach the lower part to allow the kid to place his/her feet firmly on the ground. The right size table is suitable for toddlers who are able to feed themselves without any assistant. This provides a great environment for your kid to play and eat independently. The best thing is that it is very easy to clean since you can simply wipe the seat pad using mild soap and warm water. You can wash the tray in a dishwasher. It is lightweight and very strong which makes it among the best high chairs you should consider. It also features a restraint system which offers protection to the kid. It can hold a maximum weight capacity of 40 pounds. You will also realize that it has a nice appearance as compared to others. It is made of a bright colored plastic construction which gives it an attractive look. This one is one is a top quality high chair which has 6 height adjustments and 3 recline positions to make your kid comfortable. If you have a limited space, you can simply remove the legs to create space. This makes it ideal for use in the kitchen, restaurant and also the dining room. The best thing with this chair is that it has wheels which makes it easy to move. You can convert it into a booster chair and a youth chair as your kid grows. As a booster chair, the kid can use it with a table. You can even use it as a double since two kids can comfortably use it. Another impressive thing about it is that it is very easy to clean. It comes with elastic straps which are easy to clean. It weighs 22.2 pounds and measures 32.7 X 22.8 X 41 Inches. If you are on a budget, this might be a perfect choice due to its low price. Another thing is that it has a foldable design which is a good thing for those who love traveling. This is another amazing baby high chair on the market. It features a luxurious and ergonomic design that will add style to your home decor. The good thing is that it is available in 11 different colors which give you an option to go for the one that will blend seamlessly into your home furniture. The product also features an EZ-Seat design that allows you to customize the position that suits your little one better. It can either be used as a toddler chair or as a dining chair for individuals of all age groups. Customizing a new position is super easy and may only take a few minutes to complete without the need to use any special tools. The height of the chair can also be customized. With this high chair, you may not need to worry about your little one’s safety thanks to the dual restraint system: The system allow you to adjust and efficiently secure the furniture for a 3-point harness or a 5-point harness for the maximum safety and comfort of your little one. You will probably use this product for a long period of time since it is designed for babies that weight 1 -250 pounds. Also, the Abiie Beyond Wooden High Chair is made from a top quality and durable European beech. To ensure a safe and hygienic environment for your little one, the manufacturer states that the wooden component of the high chair has passed through a state-of-the-art pressure-assisted high-temperature sterilization at 120 ° C.
Furthermore, the chair is easy to assemble and easy to clean as the simple design of the chair allows you to properly clean it within a few minutes. The tray paired with the chair supports dishwasher cleaning and the wooden component is water resistant so the chair will not absorb the spills of your little one’s meal. All you have to do is clean the piece of furniture with a wet towel. It is also scratch resistant. The tray is detachable for easy conversion to fit different purposes. The product is budget friendly and it ships with a 3-year Manufacturer’s Warranty paired with an optional low cost 1/2/3 years extended protection plans to further assure you of its quality. The product is lightweight and can be easily moved from place to place as it weighs only about 17 pounds. Storage may also not be a problem since the chair has a dimension of 34 x 3 x 16 inches. However, some users have complained that the chair sometimes makes too much noise. Others have complained that the tray is too small to accommodate their little one’s chair. Also, the chair doesn’t have a cushioned headrest and babies may bump their head onto the wooden headrest when they try to rest their backs. 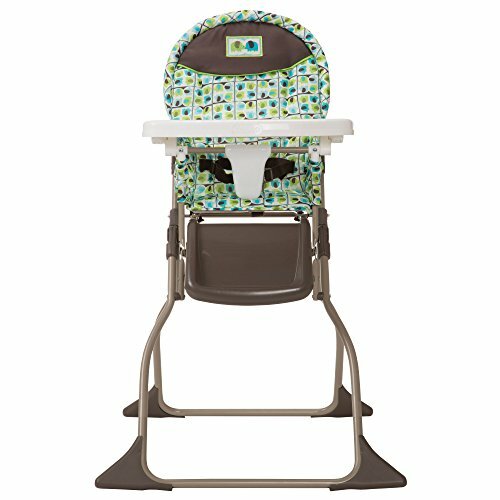 If you are looking to buy a top quality high chair for a budget-friendly cost, you should consider checking the Ciao! 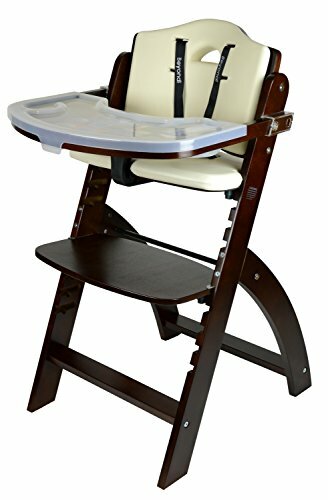 Baby Portable Travel High Chair out. The chair features a beautiful modern design with all the style you may desire from a furniture of this type. It is available in twelve different colors thus giving you an option to go for the one that works best for you. It is designed to accommodate babies that weigh 10-50 pounds and can be used for babies that are up to 3 years old. With a weight of about 8 pounds, one may safely conclude that moving the chair from one place to another will not be a problem. Storage will also be pretty easy since the Ciao! 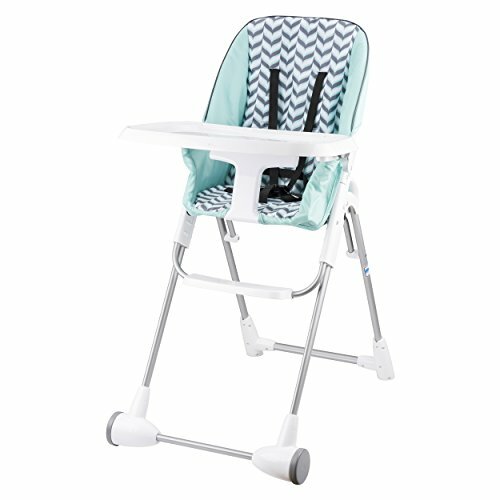 Baby Portable Travel High Chair is collapsible and it has a dimension of 23 x 23 x 32 inches. Also, it comes with a carry bag that allows you to properly pack the chair when not in use to prevent it from becoming dusty. If assembling a high chair is what you worry about, then you are in luck as this one comes ready to use without the need for assembly. The material is easy to clean and maintain and it is important to state that it is BPA-free. It features a cover, a vinyl tray, and a baby-friendly built-in cup. Your little one will be comfortable and safe in this chairs as it features a lap belt and a five-point harness. However, some parents have complained that it is difficult to get babies in and out of the chair. Others state that round shaped objects and food may easily roll down the vinyl tray. Those are the top 5 toddlers best high chair on the market. Look for any which you feel that it meets all your requirements if you would rather have a door jumper check out our review over here.